The cape has been designed by Ken Done, featuring the Endeavour on which Cook sailed to Australia. The SSP crew has then appliquéd the design onto a 2.6m x 6m, hemi-circular piece of denim. Vest fabric designed by Eloise Rapp inspired by the life and work of Joseph Banks. Her textile print is a visual representation of his discoveries in Australian botany during the Endeavour voyage, specifically the Banksia. Cook arrived at the site now called Botany Bay, a name which references the achievments of his friend Joseph Banks. Michelle McCosker has designed and made his jacket from old blankets and second hand fabrics. She has also created the giant bicorn hat design which includes Ken Done inspired sailing boats as well as references to the Harbour Bridge and Opera House, symbols associated with Sydney Harbour which the Cook statue is facing (though he never actually saw it). The knickerbockers are patchworked from multiple second hand Hawaiian shirts symbolising Cook’s experiences in Hawaii, including his death. His socks have been knitted by Michelle’s mum, Helen, using a Jenny Kee ‘Oz’ motif featuring a map of Australia. 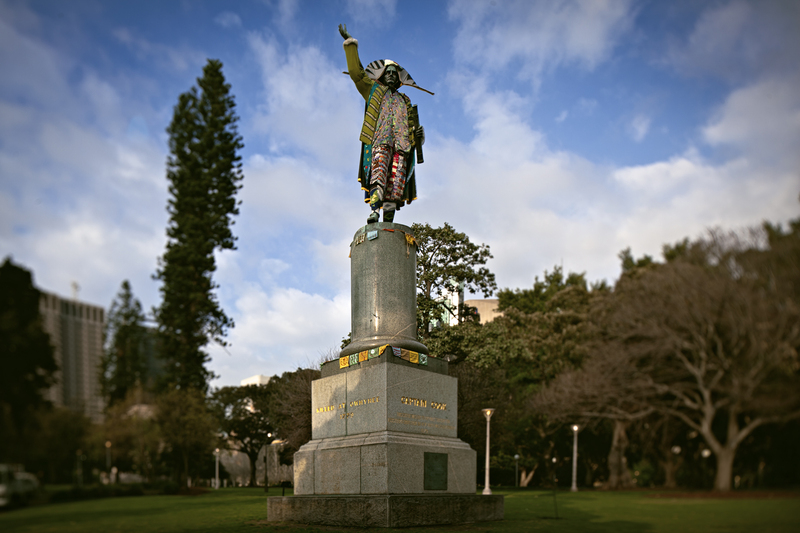 Prayer flags around the statue are by Bronwyn Bancroft, encouraging alternative thinking about Captain Cook. The flags contain written statements underpinning hope for the future and prayers for all the Aboriginal people who have lost their lives since European invasion. The flags are also a historical reference to previous protests by the Australian Natives Association at this statue between 1908-1914. James Cook (1728-1779) was a British naval captain. Born in Yorkshire, he was apprenticed to the sea at the age of 18. He joined the Royal Navy and received his first command at the age of 29. He went on to become a navigator and explorer, who recorded the seaways and coasts of Canada (1759, 1763–67) and conducted three expeditions to the Pacific Ocean (1768–71; 1772–75; 1776–79), ranging from the Antarctic ice fields to the Bering Strait and from the coasts of North America to Australia and New Zealand. In 1768 the Royal Society organised the first scientific expedition to the Pacific to find the expected southern continent, and Cook was appointed its leader. Sailing south and southwest from Tahiti, Cook reached and charted all of New Zealand, and then crossed the Tasman Sea to reach the Australian coast on April 19, 1770 where he arrived at Botany Bay on April 28. Running north along the coast for 2,000 miles eastern coast, surveying as he went, Cook successfully navigated Queensland’s Great Barrier Reef. He was killed at Kealakekua Bay in Hawaii in 1779. Cook was the first English navigator to come across the east coast of Australia and in doing so paved the way for the European invasion of Australia. Cook has often been portrayed as a villain throughout the history of Indigenous oral culture right across the country. Aboriginal communities in isolated locations never visited by Cook have been found to have local Cook stories. Cook came to represent colonial relationships and became the symbol of European ‘dispossession and disruption’. Thomas Woolner (1825-1892) joined the Pre-Raphaelite Brotherhood shortly after it was established in 1848. He travelled to Melbourne and Sydney in the 1850s and returned to England where he established himself as a sculptor and art dealer. He was elected to the Royal Academy in 1875 and died in 1892. The statue cost nearly 6,000 pounds, raised partly by public subscription and partly contributed by the NSW Government. It was unveiled on 25 February 1879 by the Governor, Sir Hercules Robinson, ‘in the name of the people of NSW’. The day was a public holiday, with 70,000 people participating in a public procession through the streets. From 1908 until the outbreak of World War I the Australian Natives Association received permission to hold a patriotic demonstration on the anniversary of Cook’s landing at Botany Bay. The council agreed to organise a band concert but declined to floodlight the statue to show off the ANA’s flags and bunting. The ANA was a mutual benefit society which provided health and funeral insurance and also campaigned to promote the rights of Australian-born people ahead of immigrants. They were instrumental in Australian Federation. In 1908 their use of the term ‘Native’ did not, however, include reference to Indigenous Australians. This statue has become a constant source of interest and re-interpretation by Australians in contemporary culture. The statue is facing Sydney Harbour, with Cook looking out towards the water, yet ironically he never set foot there. In 2005 Councillor Michael Lee raised the inscription ‘Discovered this Territory’ on the statue at a Sydney City council meeting, criticising the use of the word ‘Discovered’. He said this implied that people of indigenous background did not exist, and called for a new statue commemorating an Aboriginal leader. His views were supported by Linda Burney, an Indigenous MP in the NSW Parlimanet, who said that the claim that Cook ‘discovered’ Australia was insulting because it ignored the fact that Aborigines had lived in Australia for 60,000 years before Cook arrived. The statue’s location has also been the source of larger protests. On the 26th of January 1988 40,000 Indigenous and non-Indigenous Australians staged the largest march since Vietnam ending in Hyde Park. While down by the harbour the Bicentennial celebrations focused on the discovery of Australia with a re-enactment of the arrival of the first fleet, this protest was a reminder that Australia had been inhabited by Aboriginies at least 40,000 years before Europeans arrived. Maddock, K. (1988). “Myth, History and a Sense of Oneself.” In Beckett, J. R. (ed) Past and Present: The Construction of Aboriginality. Aboriginal Studies Press. Canberra.